This dental practice partners with Cox Media Group for all of their digital needs including their website, SEO management, paid search, social ads and more. The client likes to ensure that every dollar spent on advertising is bringing them a valuable leads. Before implementing premium tagging, the client was only able to track phone calls from different sources through unique assigned phone numbers, missing leads that might submit form fills on their website. Premium tagging allowed CMG to attribute phone calls, form fills and other valuable actions like downloading new patient forms to their marketing. CMG and this dental practice use this data to determine cost per lead and shift money where they see the highest return. They believe every dental experience should be a pleasant one so that patients continue to maintain their beautiful smiles. As a family run dental practice, they are excited to open their second office in 2019 to continue to spread smiles throughout the community. Higher conversion rate from paid traffic vs. all user traffic. This Credit Union partnered with Cox Media Group to generate awareness and grow memberships. The target audience was exposed through different touch points including pre-roll, mobile and social advertising. Paid search and re-targeting ads helped finalize the decision for consumers to bank with this credit union. For the past two years, auto loans were the main focus of their messaging with phone calls being their main KPI. In 2018, their main focus switched to home mortgage and equity loan applications. A majority of these applications were filled out online in a secure portal, not completed over the phone. Due to privacy restrictions, tracking those applications was not an option, but with premium tagging we were able to report on “Apply Now” button clicks. This provided the client more meaningful metrics beyond traffic to the website. This credit union serves over 50,000 members and over 1,000 SEGs with 12 branches. Services include personal banking (savings/checking accounts), auto loans, home loans, credit cards, investments, and more. They strive to be the credit union consumers can bank on to make their finances easy to manage. This specialist practice partnered with Cox Media Group to generate awareness of their brand in the market and grow their leads. They were running portions of online advertising in-house, but struggled with the time to monitor campaigns and measure success properly. 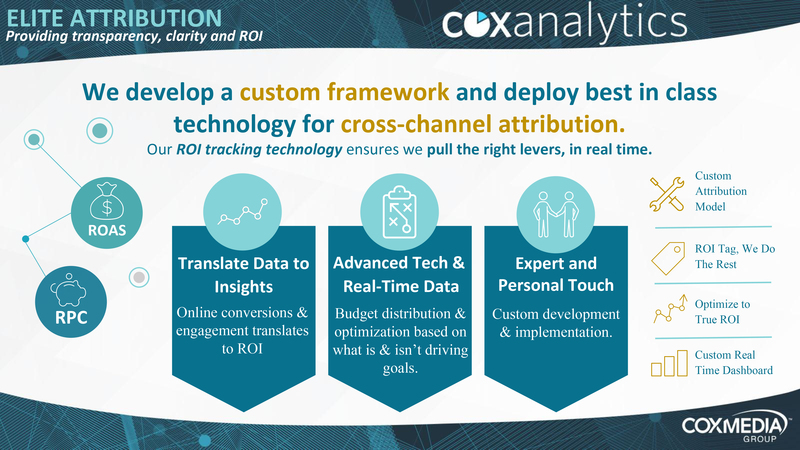 We used market research and insights to target the market, and to ensure the traffic was qualified, Cox Media Group implemented Premium Tag Management to evaluate the engagement that was taking place after the click. From there we were able to optimize the campaign based on the solutions driving the most leads. They saw immediate results when the campaign was turned on. It is a state-of-the-art national practice that offers comprehensive advanced treatment services. The practice’s team of health professionals combines medical and scientific expertise with individualized and compassionate patient care. Decrease in cost per lead after implementing Premium Tag Management. Increase in average time spent on the website by potential patients. Higher SEM CTR than the Health & Medical Industry average.